There’s been some excellent feedback from my request for a traditional Chickpea Flour Butter Fudge recipe that I put ‘out there’ a few days ago. This seems the most authentic, clearly described and reliable recipe for Mohanthal, so, as Jyotsna graciously advises, please enjoy it! 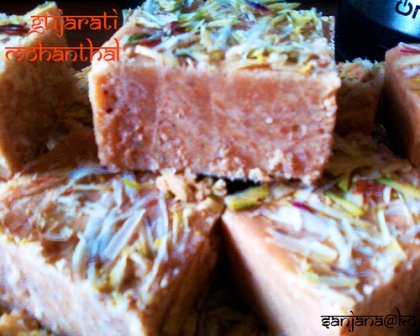 “This is our family recipe for traditional Gujarati mohanthal, written by my daughter on her blog. Please enjoy it! By the way, Sanjana’s Blog is superb. Amazing recipes from my all-time favourite cuisine, Gujarati! Highly recommended.